Reality is a slippery little devil. Our minds are so adept at creating our own version of reality that the boundaries between what is real and what is not can become so blurred as to be indistinguishable. But I digress. Problems arise when our perceptions of reality become twisted with the imaginative and creative thought processes that our human brains are so capable of. This was made clear when my husband received a phone call last night from someone he hadn’t heard from in a long time. When he queried why the person hadn’t been in touch (he didn’t have their number) they stated that he had become upset at their last conversation, and that he had put the phone down on them. This was not true – I don’t believe he has ever put the phone down on anyone, and especially would never do so to this person. This person had left the real conversation months ago, and was not satisfied with the outcome. And so, this person developed in their minds ways that it would appear that they had been wronged, so that they could continue to avoid reality and live in their preferred state of being the victim. They may have told and retold the story of the conversation in their minds over and over again, changing the details until, after a period of days, weeks or months, reality had changed. Stories change with the telling, we know this. But we are fooling ourselves when we keep changing reality to suit our own egos and emotions. I remember times when I’ve done this myself in the past – sometimes it is to justify certain behaviour, or to explain events. The key is to become aware of when you are doing it, to stop and say “Right. I know what the facts are, and I’m going to stick to them, and not change them to suit my own desires”. I still get surprised when I see this in other people – I’ve had people accuse me of certain things, of promising others and of creating a totally separate reality to that which actually occurred. It can be hurtful, at times, until you understand the thought process that creates this – you then realise that you had no part in it, that it became an entity totally foreign to your own being. This doesn’t mean that you are not responsible for your actions – we all must be the best human beings we can at this present moment. Actions have consequences. However, we must also be aware and have some compassion for those who are caught up in their own realities, to a certain extent. We don’t have to live in them, or even partake of that reality, but we can understand the reasons why. We have to learn how to live in the here and now. Being alive and present in the here and now allows no time for emotional attachment to our thoughts and feelings – we still respond emotionally to situations, but we don’t become attached to the emotion itself. As I left work yesterday, after a long staff meeting, my colleague was upset at what was said about our department, which was, unwittingly or not, derogatory. Not only does this emphasise that we need to think very clearly before we speak, but also that we also cannot attach to the emotions that follow after a certain event. I too was very displeased with the outcome of the meeting and the insinuation, and driving home could feel anger welling inside, threatening to ruin the whole drive home and run well into the evening. However, I caught myself, and brought myself back to reality and the present moment. What was the present moment? Driving home, in the late afternoon sun, putting miles between myself and the event, figuratively and literally. It was no longer happening now, except in my head. I could either let it continue to live in my head, or simply enjoy the evening. I chose the latter. This doesn’t mean that the issue will not be dealt with. It will, in a calm, rational and compassionate way. But it won’t dictate reality for me – reality is what it is, and nothing more. When the time is appropriate, the issue will be raised without undo emotional attachment to the residual event that still exists in our minds, which may have altered slightly or even greatly since the actual event occurred – reality is a slippery devil indeed. I will not go over the event again and again in my mind, perhaps changing reality in doing so. I will deal with the facts. Let us continue to tell stories, but not make up the story of our own life. Our own lives are brilliant and fascinating enough – we don’t need to add more drama to them. By doing so, we will miss our own lives, living instead in our minds and foregoing some of the wondrous nature that is constantly unfolding right before our very eyes. We can hurt other people by making up stories to suit our egos and our needs, and the person whom we hurt most is ourselves. Reality is not such a bad place. Really. I’m a big David Bowie fan, after having fallen in love with him as a young teenager, watching Jim Henson’s film, Labyrinth. He played the Goblin King, a creature who was used to getting things his own way – he was all powerful, and the Labyrinth was his to control. Or so he thought. It’s a wonderful tale, of a young girl coming into adolescence, of learning that life is not always what it seems, and that life is unfair. It’s also about making friendships along the way, about being kind and also familial obligations. There are so many ways to interpret the film, and I thought to look at it from a Zen point of view. It was interesting. Our thoughts often control us, without our even realising it. These thoughts, these intangible things, have so much power over our lives. We believe in our thoughts so much, and hold to them so much. We hold on so tightly to our thoughts, and to ourselves. Who would we be without our thoughts? Yet in Zen we try to realise the control that our thoughts have over us, by acknowledging them, by becoming the observer. Bit by bit, as we sit in meditation and go through our daily lives, we begin to see patterns emerging. We may have a thought about ourselves – I’m artistic. We tell everyone that, reinforcing that thought. Yet that is not all that we are – we may be good with animals, gardening, maths, etc. The repetitive thoughts, the ones that we say over and over again to ourselves, become a reality for us. Yet they are still thoughts, not reality. There is no substance to them. Of course, not all thoughts are bad. We need to think, to work out problems, to get out of bed in the morning even. It is in the attachment to the thoughts that gives them a false substance, a false reality. It also can give us great pleasure, living in this fantasy land of our thoughts – it means the hardships of real life cannot affect us there. We are safe, in the bubble of our thoughts. Most of us spend a lot of time being controlled by our thoughts – we never even realise it. Much like Sarah, the protagonist in the film, was being controlled by the Jareth, the Goblin King without her knowledge, we aren’t even aware of the power that they hold over us. They make us run around in circles, not getting anywhere, simply thinking, thinking, thinking – where is the doing? Where is the experience? We get angry at someone, and have a thought about that. Then we attach to that thought, and it can affect us for the rest of the day, week, year, or our entire lives. We all have emotional responses to situations, and thoughts about everything – but the attachment to them is where stumble and fall on each and every step. There is no progress – we’ve fallen down the oubliette of our thoughts until we are completely trapped in a small, dark and confined space. Instead of simply experiencing the anger and then letting it go, we’ve become a prisoner of our thoughts about the situation. And all the while, the Goblin King laughs to himself, safe in his tower, loving to watch us run around in circles as the sands of time run out. When we sit in zazen, however, we begin to notice our thoughts, our patterns of behaviour. By being the observer, we can take a step back from our thoughts and look at them without attaching to them. We can see the physical manifestations of them in our body as well – a contraction in our jaw, the hunching of our shoulders, our heart beating faster. By becoming aware, of thoughts, and indeed, of all our surroundings, we are better able to respond to situations than before. Sarah didn’t see through the illusion for a long time in the film – even though she was reminded by other characters, time and again, that nothing is what it seems. Slowly though, the illusion wavered, and the cracks in the false reality began to show. The bubble was broken, and Sarah was somewhat freed, for a time. When she finally saw through the illusion fully, and took the great leap into the unknown, literally and figuratively, that’s when she was able to come face to face with the Goblin King himself, to bring him out of hiding and face him in a final battle. So, after much practice in zazen, after much meditation and time spent being the observer to all the thoughts that run around in our head, without getting caught up in them, we face them down. We say “enough” – we are not going to be controlled by them any longer. We see the thoughts for what they are. The thoughts fight back, with everything that they’ve got – Jareth holds out the most potent, alluring thing that we all hold so dear – our dreams. He offers them to Sarah, but Sarah now sees through the false reality. She then recites the final lines from her book back to the Goblin King, saying the powerful, magical words that will defeat him. Those six words – “you have no power over me” is what can release us from the labyrinth of our minds, from the traps that our thoughts can create when we attach to them. We suddenly become free, to experience, to return to our pure self, to break loose of the chains and to truly live life to the fullest. So, the next time we fall into despair, wishing our lives were different, we can simply say those six words – you have no power over me. When our minds are rushing around as we try to meditate, we simply observe them without getting caught up in them, and repeat you have no power over me. When someone says something nasty to us, we feel the emotion, we react (hopefully with compassion) and then we let the experience go, without attaching to it, simply by saying you have no power over me. 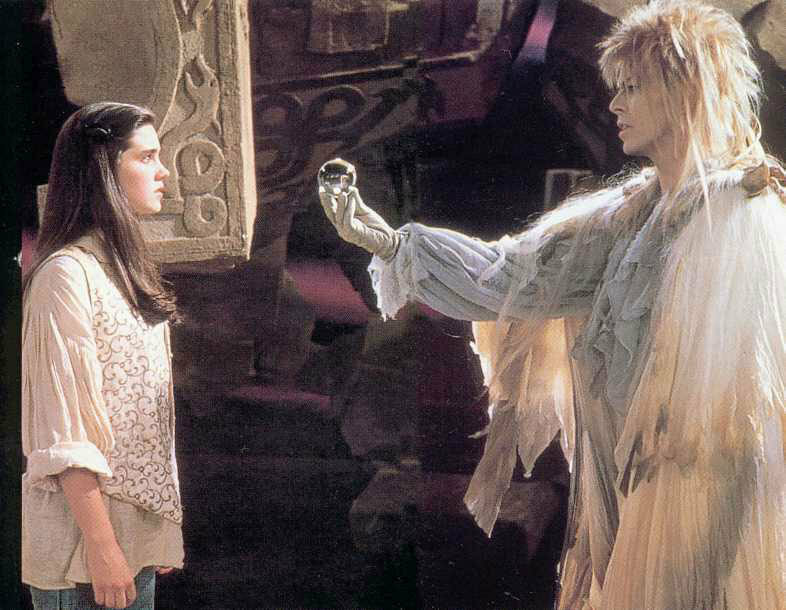 Then and only then can the Goblin King be defeated, and we freed from the labyrinth of our minds. In my experience, few teachers have Beck’s willingness to jettison all the trappings and traditions of Buddhism, in order to express themselves without disguise. I hope you’ll read the entire interview, below. I wouldn’t say a payoff. You’re returning to the source, you might say – what you always were, but which was severely covered by your core belief and all its systems. And when those get weaker, you do feel joy. I mean, then it’s no big deal to do the dishes and clean up the house and go to work and things like that. Drama. We all enjoy a bit of it every now and then. Influenced by television, film and books, we act in a similar fashion to people in those tales – or how we think they would act. Life is not at all like EastEnders, and yet, how many people do you know who try to make their lives just like that particular show? I have known plenty in my brief time on this planet so far, for various reasons – boredom and low self-esteem ranking high. Why do we enjoy the drama in our lives so much? Various reasons – it gives us attention, it makes us feel important, it turns our attention away from other things. When something is happening to us, we enjoy the opportunity to extol upon this, whether the situation was a positive or negative one (yet, in reality, there are no positive or negative situation, merely situations). The culprit for all personal dramas is the ego. Remove the ego, and all drama ceases to be. Remove the ego? Who would I be then? We are all under the false assumption that we are our egos. In effect, our egos consist of patterns of ingrained beliefs and behaviours. All of these can be changed. If all of these can be changed, then who are we? Is there a core person in the first instance, if we all have the ability to change? What would you say if I told you that you were not the centre of the universe? You would probably agree with me (I hope). What if I told you that you were not the centre of your own universe? It is only our perception of ourselves as the centre of our little universe, our dramas, that continue to lead to suffering and dissatisfaction in our lives. When we realise that, in fact, our own universe does not even exist, we can move away from both it and the drama that we create to sustain it – just think about all the energy that we pour into something that doesn’t even exist. We cannot have our own universe, for we are sharing it all the time with everything on this planet, indeed in this universe. Uni – one. Not separate. When we realise that, our worldview shifts dramatically. Not being the centre of our own universe means not reacting to every little or large thing that happens in our lives. If someone upsets me, who is the “me” that they are upsetting? Why am I reacting, getting upset? For comfort from someone else, for attention, to be told that I am right and that they are a horrible person? Who is this person that is upsetting me? Who am I? By combining Zen and Druidry in my spiritual path, I have come to realise many things about myself, whoever this self is. I don’t have to react to everything. Things will happen, I have no control over them. What I do have control over is my reaction to them, or lack of reaction. Much like in nature – the daffodil rises early in January, and then dies from killing frosts in February. Does it get upset about it? Why do we let our human consciousness impede our lives so much in this way, when all of nature seems to cope without the drama? The daffodil will bloom again when it can – as simple as that. Seeing how nature copes, combined with the principles found in Zen (of no separation, the destruction of the “self”) has really opened my eyes over these last two years. Zen teaches us that when we see Buddha on the road, we should kill him. Why is this? Because there is no Buddha external to us – it is inherent in all of us. To believe otherwise is to believe in fallacy. When we realise that Buddha is in everyone, why be all dramatic about anything? As Charlotte Joko Beck stated, and titled a book – Nothing Special. Living with this mindset, that life is nothing special, has, paradoxically, the effect of seeming to make everything special. Life becomes special, when we take our egos and the drama out of it, and see it for what it really is. It becomes real, as opposed to the imaginary world that we create to indulge our egos, our imaginary universe where we are the centre of existence. Which would you prefer to live in? Note: Zen Druidry is a book that I am writing for Moon Books, looking at how Zen and Druidry can combine to create a worldview that awakens one to the natural world with full awareness. For more wonderful titles from Moon Books, please see their website at http://www.moon-books.net.